Posts can be organized by categories as well as by tags. Categories are meant to be a general classification of posts, while tags are designed to offer more detail. Categories can include sub-categories, or "Child" categories, for better organization. For example, we may have a category for "Refinance" but within that category we have articles about cash-out refinances and streamline refinances. It may make sense for us to create a category for "Cash-Out Refinances" and "Streamline Refinances" to better organizes those posts. The combined total of categories and tags assigned to a page should not exceed 15 as a rule of thumb. Categories also have an archive page associated with them. This is a page that lists articles by date that are assigned to that category. Categories can be added or selected when creating a post, but there may be times we want to manage them separately. Under the Posts tab of our main navigation, we can select Categories for more options. Once in the Categories page, we can add new categories and manage existing categories. To add a new category we will complete the fields on the left of the page. The first field allows us to name our category. This will be how the category appears on the site, so be sure to capitalize and format appropriately. 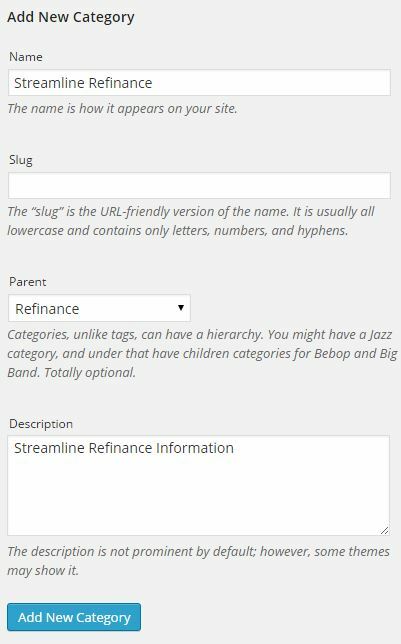 If we leave this field blank, the "Slug" for our category will be automatically formatted using all lowercase letters and a hyphen separating words (streamline-refinance). We suggest using this default formatting. This is where we will assign sub-categories, or "Child" category, to "Parent" categories. 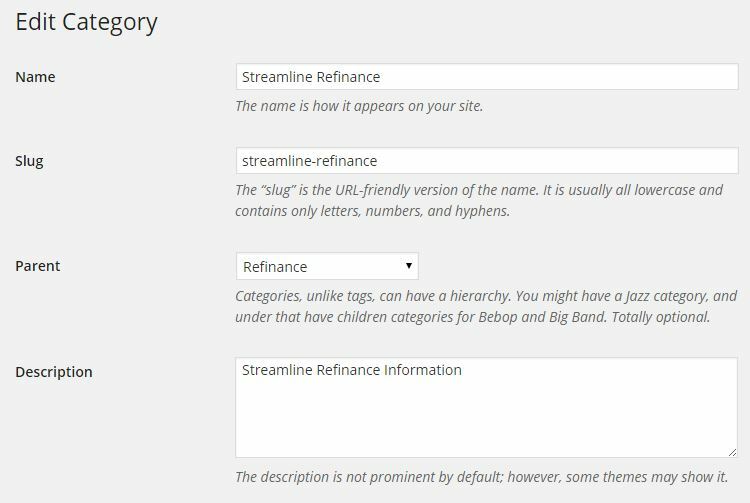 We want to add "Streamline Refinance" as a sub-category of "Refinance". Descriptions will rarely be displayed on the site, but you can give a category a brief description to explain more about the category. Once you have completed the necessary fields, you can click Add New Category! To the right of the page we have an overview of our existing categories. This section will tell us the name of our categories, descriptions, slugs, and the number of posts per category (count). 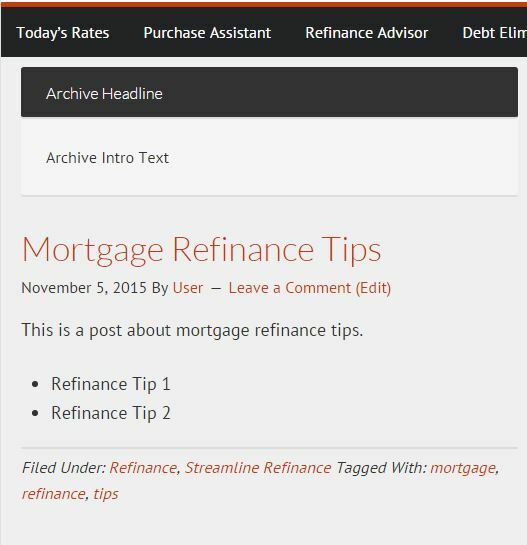 You may also notice the dash next to Streamline Refinance. This is to indicate this the category is a "Child" or sub-category of Refinance. Clicking on the count number will take you to the posts overview for all pages assigned to that category. Once we have created a category, we can make changes to it by clicking on the category name. This will allow us to change what we have already as well as enter a bit more information we haven't had access to yet. Once in the editing section, the first changes we can make will be to the information we have already entered when creating the category. Next we can update Sidebar Options. Category archive pages are assigned default sidebars when created, but if you wanted to use a unique sidebar for a certain category, that can be accomplished here. 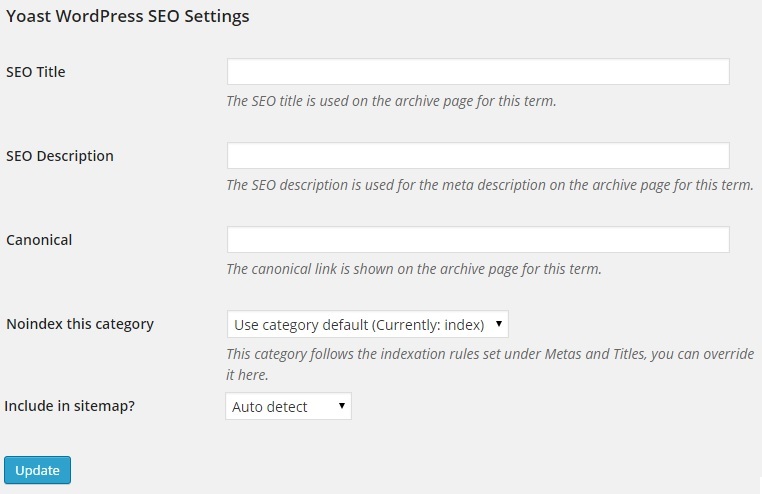 We can give our category archive pages an introduction through Archive Headlines and Archive Intro Text. This information will appear at the top of the archive page. These fields can be used to give a bit more information about the posts contained within the category. By default, there is not an introduction. Here is an example of how the Archive Headline and Archive Intro Text will appear on the page. Our SEO information can be edited for our archive page in this final section. Only the SEO Title and SEO Description should be changed here. The remaining fields are assigned default information that we do not want to change. 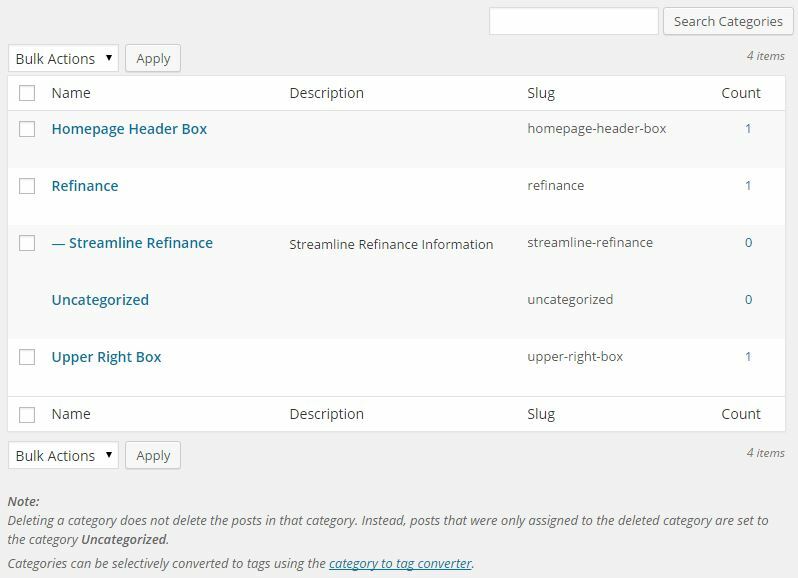 For a better look at SEO Titles and Descriptions for the Yoast Plugin, click here. Once you have made all of your changes, click update at the bottom of the page!